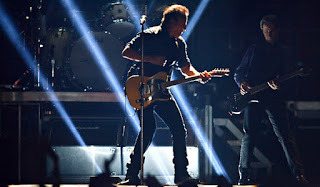 After two and half years, Bruce Springsteen and his legendary E Street Band returned home to New Jersey for back-to-back nights at the Izod center. I was lucky enough to make both shows. Admittedly, the first night left me slightly unfulfilled - my major complaint was it felt too contained for a Bruce Springsteen concert. I missed the spontaneity of the Magic and Working on a Dream tours. All such qualms were instantly eradicated on the second night when he unleashed the heart-stopping, pants-dropping spectacle he’s led us to demand. I don’t mean to sound too harsh on the April 3 show. He's still the most electrifying entertainer I've ever seen and by all means it was yet another great performance. But I felt justified to see that Backstreets' reviews of the nights expressed similar concerns. Also, the first night's show was hampered by two external factors for me. The first was my quixotic hopes that he would play songs from The Promise. My desires were fueled by his debut of “The Promise” on Sunday night in DC and his intro speech and opening chords to "So Young and in Love" sounded like personal favorite "Ain't Good Enough For You" (I should note, "So Young and in Love" was fantastic in it's own right. Second was my anxiety about actually getting into the concert. Ticketmaster has always been pure evil but their paperless tickets are the work of the devil. On the second night though, by all accounts Bruce came out swinging with “The Ties That Bind” third on the setlist. I've always loved that song and dreamed of seeing it live for the 2:56 moment when Bruce screeches the titular lyrics (a moment that the Legends of Springsteen editors refer to as the sound of Bruce crying). Overall, the second night had more high-five moments (“Candy's Room”! “Johnny 99”!! “Ramrod”!!!) and the tour staples were performed at full tilt, too. Bruce also unveiled a video tribute to Clarence during “Tenth Avenue Freeze-Out” that made the night all the more poignant. From the Wrecking Ball tracks, the band plays them all most impressively, my favorites being the subtle power of “Jack of All Trades” and the bombastic “Death to My Hometown” in which Bruce does an awesome march/dance that tops the borderline ridiculous histrionics of his guitar strumming during the Jimmy Fallon appearance. My takeway from both nights - something I’ve always recognized but never so acutely before – was Bruce's conviction. Every word he says, every line he sings, every expression he pulls, every gesture he makes, and every bead he sweats is done with conviction. He truly believes in the power of rock n roll and he wants his audience to feel the same way. I don't think in alone when I say that his emotion is infectious. In fact, I know I’m not from watching 20,000 people singing, cheering, and clapping in unison. I also suspect I’m not the only one who’ll admit that on several occasions, I found myself on the verge of tears from the overwhelming swell of emotion that Bruce Springsteen can elicit. For videos from Tuesday night, head over to Blogness on the Edge of Town and check out the New York Times and Bergen Record for other reviews. Excellent post Steve- Bruce is truly the last god of arena rock. Bruce is all time guitar perfectionist!